FLINT TWP. 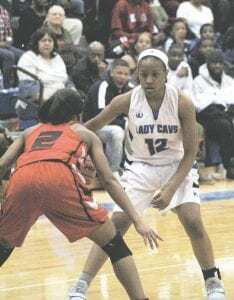 – The Carman- Ainsworth girls’ basketball team embraced the ‘play to the final buzzer’ mantra when it faced Grand Blanc at home last Friday, pulling out the 45-32 win in the fourth quarter. Carman-Ainsworth came out of the gate hot, outscoring Grand Blanc 16-3 in the first quarter. Grand Blanc rebounded, though, and outscored Carman-Ainsworth 10-4 in the second and 11-6 in the third. The fourth quarter proved key for Carman-Ainsworth, which overpowered Grand Blanc 19-8 to steal the win. Chenelle King led Carman- Ainsworth with 14 points and Arie Lewis had nine points and 11 rebounds. Carman-Ainsworth is currently ranked 33rd in the state by Maxpreps at 11-3 on the season. Carman-Ainsworth’s Tuesday game against Davison was canceled because of the dangerous cold conditions.